Following the attacks of 11 September 2001, George W. Bush said of the perpetrators: "They are evil, we are good". Bush responded to the disaster with severe restrictions on civil liberties, declaring to his critics: "Either you are with us, or you are with the terrorists". When Timothy McVeigh blew up the federal building in Oklahoma City in 1995, Bill Clinton likewise introduced draconian legislation, and suggested that those who were against the measures were terrorist co-conspirators and "unpatriotic". In Perpetual War for Perpetual Peace, the masterful, award-winning writer Gore Vidal transcends the simplistic black-and-white sloganizing of politicians and the corporate-sponsored media. Far from being an apologist for terrorism, Vidal makes a rational investigation into the causes behind the devastating events of 11 September and the Oklahoma bombing. He even enters into a remarkable correspondence with McVeigh, partially reproduced here. One of the last great independent thinkers, Vidal refuses to be steamrollered by the weight of "received wisdom" and media consensus. "Things just happen out there in the American media, and we consumers don't need to be told the why of anything", he observes. Unsurprisingly, his attempts to publish an essay on 11 September met with failure in his native USA. The United States, argues Vidal, has been engaged in what the historian Charles A. 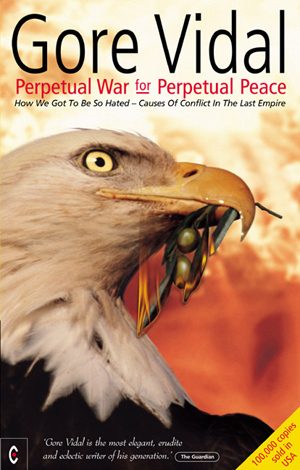 Beard called "perpetual war for perpetual peace". The Federation of American Scientists has catalogued nearly two hundred military incursions since 1945 in which the United States has been the aggressor. In a series of penetrating and startling essays, Gore Vidal challenges the cosy conclusion following both 11 September and the Oklahoma bombing that these were simply the acts of "evil-doersE. As he explains in his introduction: "With both bin Laden and McVeigh, I thought it useful to describe the various provocations on our side that drove them to such terrible acts". GORE VIDAL is the author of twenty-two novels, five plays, many screenplays, more than two hundred essays, and a memoir. He was born in 1925 at the United States Military Academy at West Point, and brought up in Washington, D.C. He enlisted in the army at the age of seventeen and served as first mate on an army ship in the Bering Sea, where he wrote his first book, Williwaw. In the sixties, three praised novels established Vidal's reputation as a bestselling author: Julian (1964); Washington, D.C. (1967); and Myra Breckinridge (1968). His collected essays, United States, won the National Book Award in 1993. In 1995 he published a memoir, Palimpsest, which the Sunday Times called "one of the best first-person accounts of this century we are likely to get".